Not long ago, those evil people at Apple stole our headphone sockets and forced us to use their proprietary headphones or one of their adaptors. There was fighting in the streets, human sacrifice, dogs and cats living together… mass hysteria! Or at least so the media would have you believe. As it turned out, most people just got on with it and the fact that Apple provided both a set of headphones and an adaptor in the box meant it really wasn’t much of an issue after all. Now, to say that it didn’t present a few little logistical grumbles would be fair. For instance, you cannot charge your device whilst listening to music unless you have a different adaptor or Bluetooth headphones. Then there is the fact that you have to always have the adaptor with you if, like most people, you have multiple sets of headphones – one in your bag, maybe one in the office and one at home. Apple would tell you that the adaptors are only £9 each, so you can buy more. Of course, they would. 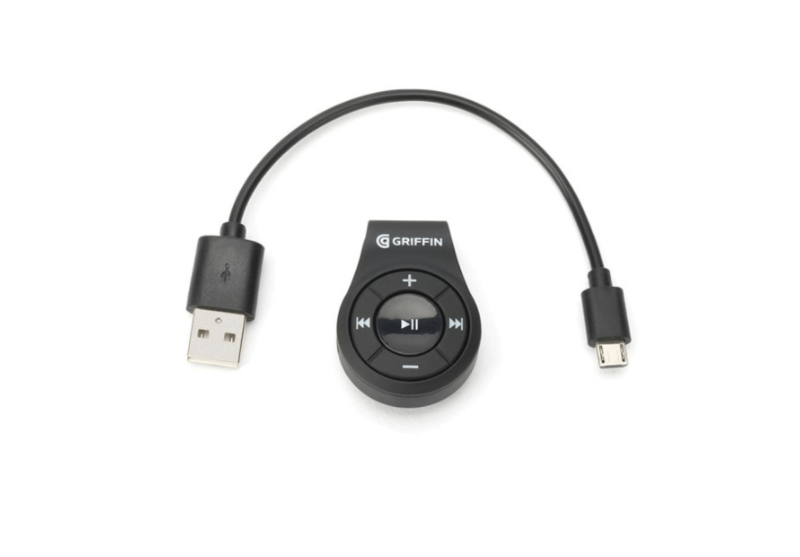 Then comes along the Griffin iTrip Clip (no apple accessory can start with anything other than an “i”), an absolutely genius diminutive device that solves a problem simply and tidily. The iTrip allows the user to plug in any regular old headset and instantly convert it into a Bluetooth set, complete with handy-dandy controls for media playback and volume up to a range of 15m. It also has a built-in microphone to allow you to make your headphones into a Siri-compatible hands-free kit. Want to plug it into your car’s aux socket and stream music and calls from your phone? It’ll do that too! And the joy of it is that the device itself is very small and neat, it weighs almost nothing and has a clip for attaching to your clothing. There is no display on the device, but red and blue LEDs indicate its status and helpfully lets you know when the 4-6 hour active battery life is coming to an end. So how much is this do-it-all-dolly? You’ll find it for under £20! Bargaintastic! Now the device is by no means perfect, I noticed immediately that the volume was much louder than when the headphones were plugged directly in. Normally I’d have the headphones volume sitting around half way, but through the iTrip, I get the same volume at about a quarter of the way up the scale. Not a huge deal, but if like me, you like to listen to music at night just before you drift off, the very first volume point is about the right volume for me, but if you wanted it any softer…..unlucky. When turning on, off or connecting to a device there is an electronic voice that confirms the action. Handy, but watch out, this is loud too! In saying that, I’d rather have to turn the volume down than have to max it out just get any sound out. Music streams perfectly clearly through the little Griffin, the responsiveness is spot on and there is very little lag time between pressing the button and the reaction on the device, but I did notice that when I was watching videos, there is an ever so slight delay between the video and the sound. This delay isn’t present when the headphones are plugged directly in, but it is consistently present when using the iTrip. It’s only slight, but it’s enough to throw the lip synch off just enough to make everything looked like it’s been dubbed into English. The clip used to attach the device to your clothing is somewhat stiff and is moulded into the unit. Personally, I would prefer something a bit less snappable if you are trying to push it onto a heavy coat etc, maybe a spring clip or similar. This is a very minor issue though and for £20, if it snaps, you aren’t going to be in floods of tears, mourning its loss. I’m amazed that Griffin can produce this device in the £15-20 range and at this price point the functionality it delivers dwarfs its few little niggles. Sure, I’d like a longer battery life, but then the device would probably have to be bigger and the price would definitely go up so it’s a good balance. This is an easy recommendation for anyone with an iPhone 7, but beyond that, it will also work with any phone or tablet, making it a versatile little gizmo that anyone could use. Thumbs up from me.